When Justin and I were living in NYC we spent many a Saturday afternoon sucking down gin martinis and eating mussels at a little restaurant just around the corner from our apartment. 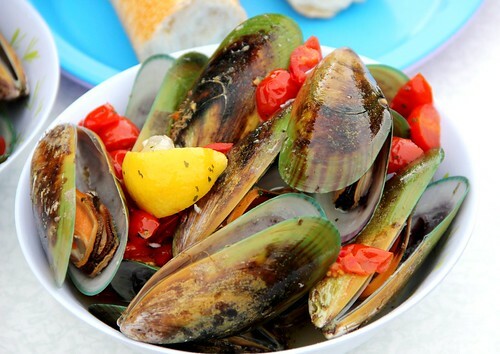 Unfortunately, mussels aren’t usually in our backpacker budget, so we were thrilled to be passing through Havelock, New Zealand (the green lipped mussel capital of the world!) where mussels are a dime a dozen. Ok, so not really a dime a dozen, but about $3.50 per kilo. That’s $3.5 for more than two pounds of mussels. Big ones. Fresh ones. Delicious ones. We wasted no time hitting up the local vendors and were steaming up a massive batch for dinner at our campsite. We may have done this for three nights in a row. It was amazing. Green lipped muscles are my favourite, it’s the one thing I’ll give the Kiwis!